What innovations are needed, in order for bicycles to be used as transportation? In general, North American innovations to city-bike design tend to Americanize traditional European bikes, by creating a lighter, faster, or prettier bike that will appeal to North American tastes. In this, there is an implied critique that existing European bikes are inadequate to American riding conditions. Yet a wide range of utility bikes are available now, whose usefulness has been proven already in other parts of the world, many of which are as traffic-clogged, potholed, and hilly as American landscapes. I include in the existing pantheon everything from sturdy Dutch and Scandinavian city bikes, classic English three-speeds, and vintage 10-speeds enhanced with promenade handlebars, fenders, and a basket. Even the newer “city bikes” from companies like Electra, Linus, and Public, some of which feature only metaphorical chainguards rather than a real chain cover, and derailleur gears rather than internal gearing, suit the casual errand-runner very well at a good price. These bikes are ideal for exactly the kind of riding that Americans can be doing: short rides, to destinations close to home. No one’s suggesting that European-style city bikes are suitable for mountainous 40-mile commutes, any more than I’d suggest a mountainous 40-mile commute was a very good idea. Some innovations merely solve problems that don’t exist. Remember Shimano’s innovative “Coasting” drivetrain system, which featured a generator-powered automatic shifter so the user didn’t have to shift her own gears? No? You don’t remember that? Yeah, neither does Shimano. Whether or not there’s really a need for much innovation in bicycle design (and the folks at Oregon Manifest have clearly heard this line of thinking—they devote a post to the subject on their own site), events like the Constructor’s Challenge are delicious times for bike geeks. The bikes were thought-provoking and fun to look at, and the level of craftsmanship was stunning—even the less practical designs were beautifully executed. 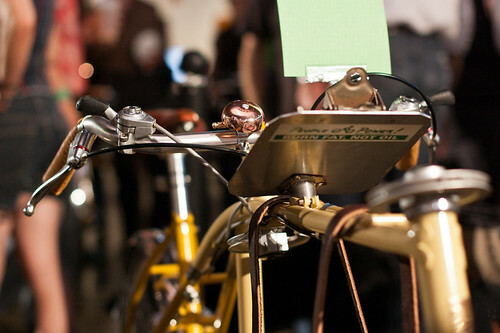 At this year’s event, the judges’ choice for best of show was chosen on its merits to the prospective bicycle user. Designer and framebuilder Tony Pereira won the Constructor’s Challenge with a bike designed to get someone out of their car and onto the saddle. It’s a beautiful machine, with a style that manages to mix aspects of randonneur bikes and classic American faux-moto cruisers. The key design innovations—electric assist, a music system, and a lockable cargo box—are aimed directly at someone who wants to ride a bike, or ride a bike more, but wishes the experience were a little more like driving a car. 2011's winning design, from Pereira Cycles. Photo by PDXCross. Thus the music, the effort-reducing electric motor, and the very practical notion of being able to lock away a few items securely in a cargo compartment. It will be interesting to see how these ideas trickles down to production bikes. The value of Pereira’s bike depends on the “Tesla gambit” (a term I just made up), which supposes that incredibly expensive, innovative items like the Tesla electric sports car will appeal to wealthy users, who will then create a demand for more quotidian versions of same, since the majority of Americans want to be like wealthy people. This concept hit home for me when I saw an article in the Wall Street Journal that was very excited about Oregon Manifest in general and the winning Pereira bike in particular. 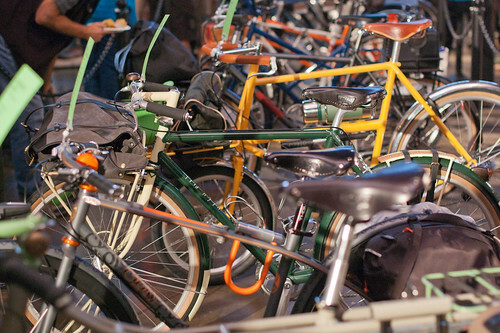 Meanwhile, which of the bikes at Manifest are more useful to people who already use bikes? And, more specifically to my interests and the interests of Vélocouture’s readers, which entries would serve the use patterns of everyday urban bicycle users? I was disappointed that there were so few improvements on everyday equipment, like chainguards (or, for that matter, any chainguards at all), or innovative generator-light systems (for trikes, say). On the other hand, several bikes featured smartly-designed kickstands meant to support a front load. And I was excited to see many bikes that aimed to fill the gap between a standard city bike and a larger, full-duty cargo bike such as a bakfiets or Christiania trike. My three favorite bikes all addressed this type of use—they were able to carry large or bulky cargo, and/or a kid, but on a slimmer platform, and with more versatility, than the standard cargo bike. 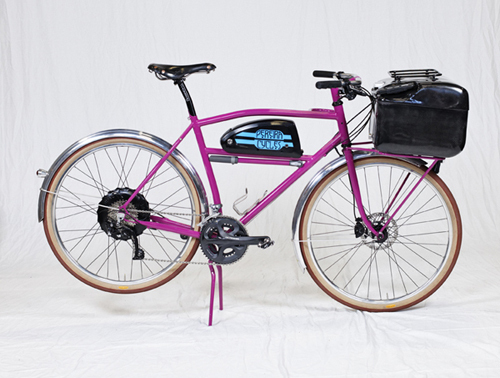 The Ballena, from Josh Muir's Frances Cycles. Photo by PDXCross. I loved the Ballena, from Joshua Muir of Frances Cycles. 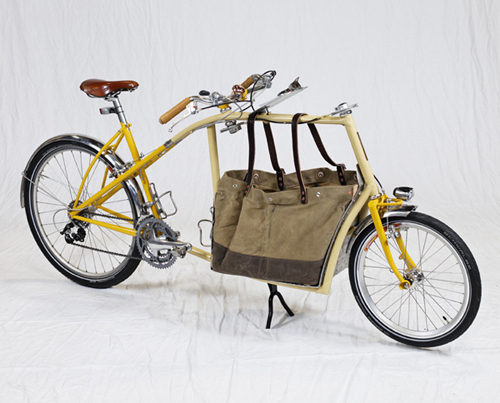 The bike is essentially a lightweight version of a long-wheelbase cargo bike. It features two innovations that Muir first developed for his Smallhaul bike: a perimeter frame, where the frame itself provides structure to the cargo box; and cable steering, where the traditional steering rod of a long-wheelbase bakfiets is replaced with a pulley-and-cable system that can be routed through tighter spaces. 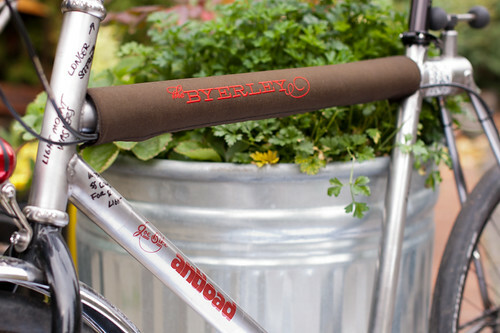 The bike also features a small, rigid-bottomed cargo space with a gorgeous heritage-chic canvas bag and rain fly. The frame is built into couplers, so that it may be broken down for easier transport. Muir offers a thorough description of the bike on his blog. I noticed a small stand on the Ballena’s double top tube that, in the show, was used to hold a clipboard with a route sheet on it. Muir explained that it is an accessory port, designed to hold a variety of things, including an additional seatpost where a young stoker could be seated and added to the drivetrain by way of a second bottom bracket. 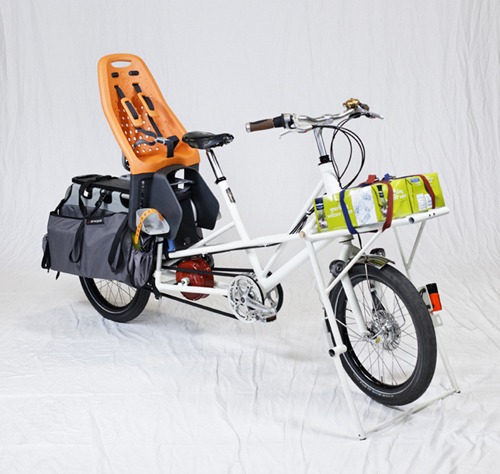 Up to now, a lighter-duty cargo bike that could also serve as a tandem for kids is something I have only dreamed about, not actually seen or heard of. I have yet to see this part of the bike in action, and hope to hear more as this idea develops. In the same way that the Pereira is a great bike for people who are just starting out with a bike for transportation, the Frances Ballena is great for people who have been using a cargo bike to carry kids for a few years, and, now that the kids are older, are hoping to get the added benefit of cargo that pedals. Kind of like an e-assist, except you have to feed it and ask it to clean its room. The trick to making a kid-specific tandem work is accommodating for its brief usability window. A child will be pure cargo for the first five or so years, and then could be a stoker on a Ballena (or similarly designed kid-tandem) for a few years, but after the young one is on her own ride, the kid-tandem needs to be useful in another way. The Ballena addresses this elegantly; at its core, it is a well-designed medium-duty cargo bike, with some built-in flexibility that could provide an ideal solution for a growing family. From all reports, it’s a great bike to ride, too, and I wish I’d had a chance to try it out myself. I look forward to further developments on this theme from Frances Cycles. Another bike that really appealed to me was Metrofiets’ entry. Metrofiets' entry to the 2011 Challenge. Photo by PDXCross. 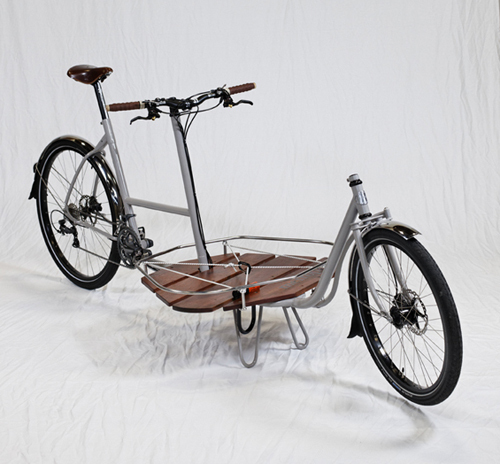 Like the Frances, it builds upon an existing design—in this case, Metrofiets’ aesthetically luscious interpretation of the classic long-wheelbase cargo bike. Metrofiets’ entry into the 2009 Oregon Manifest was a super-light flatbed cargo bike. The 2011 entry is a bit more robust—sleek and graceful, yet utilitarian and strong. The addition of a low, “skirt-friendly” top tube adds the structural benefit of a cross-frame with the linear elegance of a horizontal tube. Instead of their usual single main beam supporting the cargo area, Metrofiets used a triple-beam solution—let’s call it a “demi-perimeter” frame—to support the cargo area. In addition, they employed a larger rear wheel than usual, to provide a smoother ride on rough surfaces. The overall bike looks just like a Metrofiets, but when you dig a little deeper you find a bike that’s a little lighter and stronger, and that incorporates some sensible thinking for long-term use, like the use of standard, off-the-shelf components for ease of maintenance. From where I sit, Metrofiets has used the Oregon Manifest for its highest purpose: as an opportunity to try out new ideas on a show bike, and to take the best of these ideas and apply them to their custom and production lines. The other bike that attracted my attention, even before the show began, was the Clever Cycles/Quixote Cycles collaboration, called the Xtravois 2.0. The Xtravois 2.0. Photo by PDXCross. As the name suggests, this bike is, like my other favorites, based on a successful existing design. The original Xtravois, designed by Clever Cycles owner Todd Fahrner in 2003 as a purpose-built platform for the Xtracycle longtail cargo system, presaged the plethora of cargo/kid-hauling longtail frames that are now available. The Xtravois 2.0 is similarly designed to work with Xtracycle’s system. I am not personally a big fan of the Xtracycle system—I’m more of a front-loader, frankly—but despite that, I am struck by the potent blend of craftsmanship, functionality, and dialed-in precision of of this bike. As a kind of preview, Fahrner provided “a super geeky breakdown of the design, its background and rationale” in a post on Clever Cycles’ site a few days before the event, and I won’t attempt to improve upon his description. Suffice to say that as far as I could tell, no one had put more consideration into every aspect of a bike’s design than this team. What is especially impressive is how so many of the design innovations are based on real-world experience—from the original Xtravois as well as the accumulated wisdom gained from four years of selling utility bikes to Clever Cycles customers. Furthermore, the Xtravois 2.0 was the only bike that seriously addressed the issue of carrying kids, to the extent of carrying a young passenger on the field test, and for that alone it stands above every other entry in the competition. Overall, I really enjoyed this year’s Oregon Manifest. From what I have seen in photos, it looks like tagging along with the field test would be a good time too. The event is still in its infancy, and some growing pains that were there in 2009 continued in 2011. The opening night, when the bikes were displayed, was crowded and oddly lit, so the bikes themselves were hard to see and inspect. As in 2009, there was no formal description included with the bikes, leaving viewers to guess at some of the less obvious design features and innovations of each bike. A bit further afield on my wish list, I’d like to see a separate category for quotidian solutions—for the everyday bike user to have a chance to show off his or her home-brewed city bike conversion. But even for a cranky guy like me with all my misgivings and sub-par night vision, the Oregon Manifest is bike nerd heaven. They’re providing a fun and interesting event for bike framebuilders, industry designers, and the public, and I look forward to seeing what all the builders have to offer for Manifest 2013.